The concept of sustainability, which is closely connected to the concept of Corporate Social Responsibility (CSR), indicates the interchange of economic, ecological and social aspects. This definition was already part of the report of the 1987 Brundtland Report “Our Common Future” and applies until today. After the UN Global Compact was founded by Kofi Annan these aspects were cast into concrete principles. In addition to this, the EU Commission defined CSR in 2011 as “the responsibility of enterprises for their impacts on society”. To act in a sustainable manner, Infineon considers all aspects – economical, ecological and social – simultaneously and adequately. The strategic focus on the three pillars energy efficiency, mobility and security provide a substantial contribution for sustainable applications and end products and subsequently also for the creation of a sustainable society. This article describes how Infineon takes over voluntary responsibility within the framework of its CSR strategy and how it deposits this in products and its supply chain management. 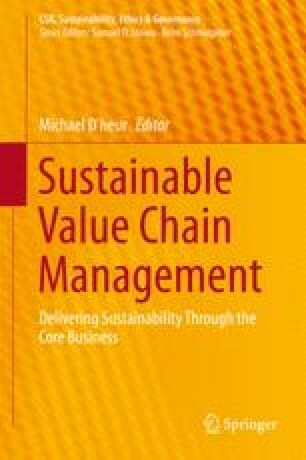 Special focus is given on how a holistic supply chain management reaches sustainability through flexibility. FIS. (2013). Ökobilanz nach DIN EN ISO 14040 und 14044. http://www.forschungsinformationssystem.de/servlet/is/349763/. Accessed 12 March 2014. Geotherme Unterhaching. (2014). Die Geotherme Unterhaching. https://www.geothermie-unterhaching.de/cms/geothermie/web.nsf/id/pa_home.html. Accessed 13 April 2014. Infineon. (2012). Geschäftsbericht. http://www.infineon.com/dgdl?folderId=db3a30433b47825b013b4d4bda8c1a55&fileId=db3a30433b92f0e8013b98a551e91604. Accessed 12 Juni 2013. Infineon. (2013). Geschäftsbericht 2013. http://www.infineon.com/dgdl?folderId=db3a3043429a38690142a45dfa551095&fileId=db3a304342e8be2c0142fc6fd2054f22. Accessed 23 April 2014. Robecosam. (2014). The sustainability yearbook. http://www.robecosam.com/en/sustainability-insights/library/the-sustainability-yearbook.jsp. Accessed 23 April 2014. ASCC. (2014). APICS Supply Chain council. https://supply-chain.org/scor. Accessed 23 November 2014. The European Commission. (2011). A renewed EU strategy 2011–2014 for corporate social responsibility (p. 6). http://ec.europa.eu/enterprise/newsroom/cf/_getdocument.cfm?doc_id=7010. Accessed 12 March 2014. United Nations. (1987). Report of the world commission on environment and development: Our common future. http://www.un-documents.net/our-common-future.pdf. Accessed 12 March 2014.